A range of disposable surface, hand and patient wipes for effective and convenient cleansing where water is absent. Bigger and tougher than regular wipes for shifting mess and spills aro.. Stainless steel and metal 3-in-1 surface cleaning wipes clean, polish .. Designed to clean and sanitise food probes and kitchen utensils prior .. Heavy duty carpet and upholstery cleaning wipes efficiently remove spo.. Simple but effective cleaning wipes for hands, tools and general surfa.. 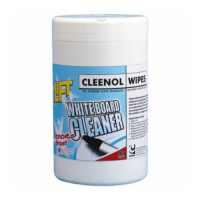 Lift White Board Cleaner Wipes are specifically created to remove perm..
Smaartwipes Heavy Duty Abrasive Wipes are bigger and tougher than regu.. Designed to clean and kill all bacteria on hard surfaces. ideally suit..
A simple but effective cleaning wipes for hands, tools and general sur..